Computers are very important to me. After all, I work as a webmaster so I’m around computers all day. When I heard that NHL’s school wasn’t *really* teaching him about computers, but only letting them go online to visit some kid-oriented websites, I decided that *someone* had to teach him about computers. After all, computers are important in today’s society. A computer-literate child has more opportunities than a computer-illiterate one. I quickly decided that I should have semi-regular computer lessons with NHL. The next time our little "computer class" met, I taught him about some of the components in the computer (CPU, memory, hard drive) and had him power up the computer. Then I had him start FireFox and I taught him how to search Google, create Bookmarks and browse websites. Finally, I showed him how to turn the computer off. For the third session, we played around with KIDO’Z (which I reviewed last year) and TuxTyping. The former is a kid-friendly web browser that presents them with kid appropriate (and parentally controlled) websites, videos and games. The latter is a typing game that helps kids learn the layout of the keyboard. The difficulty can be as simple as single letters falling to short words to long words. The words fall attached to fish that Tux the Penguin is waiting to eat. As you type the words correctly, the fish are prepared for Tux’s belly. Both are free. Still to show him (though previously introduced) are TuxPaint, an excellent kid-friendly painting program, and TuxMath (aka Tux, of Math Command) a game where you need to protect your moon base against incoming comets by solving the math problems displayed on the comets. This game teach addition, multiplication, subtraction and division and can be configured everywhere from easy (type the number 7; 1 + 1 = ?) to difficult (? x 13 x 7 = -546). It also has a "Facteroids" game which plays as like Asteroids only with fractions. As NHL loves math, TuxMath is sure to be a favorite of his. I also plan to introduce him to word processing via the free OpenOffice.org. 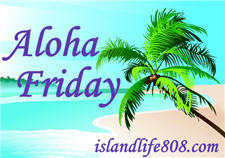 My Aloha Friday question to you is: How do you teach your children about computers? What programs do you use? Any you can add to this list would be greatly appreciated. I actually don’t give my kids access to the computer. Even my 8 yr old doesn’t get to use it much at all. I really don’t feel like my kids need to get quite that involved in the internet quite yet. .-= Cat´s last blog ..Batter Up Kids Pink Princess Baking Set Giveaway =-. Hubby has has master in computer science, he has been with computers since the dawn of ages. Our daughter has learn since she was little. Hubby would get her all sorts of learn tools and programs. All yours sound great. .-= Auntie E´s last blog ..Friday follows & Aloha fridays- Parties =-. I’m afraid I’m the one that doesn’t know much about computers. Our kids know so much more about them because they have always had technology classes in school. The kids teach us! .-= Kari´s last blog ..Aloha Friday – What Makes You Smile? =-. We use pbskids.org & starfall.com a lot with our two little ones. .-= Storms´s last blog ..Aloha Friday – Kidney Stone edition =-. When my kids were younger we had a lot of fun and educational computer programs for them. .-= Harriet´s last blog ..Are you happy? I am…I got a new iPhone! =-. .-= twincerely,Olga´s last blog ..Post-it note Tuesday!!! =-. I’m afraid I can’t answer your question, but I still want to wish you a happy Friday!! Oh my!!! He may be more computer literate than I am. I suppose I really should teach Big Brother how to get to his stuff on my computer and let him go for it. He does play star fall sometimes but that is really it.